Mercedes uses the yellow accents very sparingly. After launching the sleek refresh for the S-Class Coupe and Cabriolet at the Frankfurt Motor Show in September, Mercedes-Benz now opens the order books for them in Europe ahead of the first deliveries in January 2018. To inaugurate the updates, Mercedes-AMG launches the limited S63 Coupe 4matic+ Yellow Night Edition, which is only available for six months. The lavish model starts at 202,121.50 euros ($237,688 at current exchange rates). 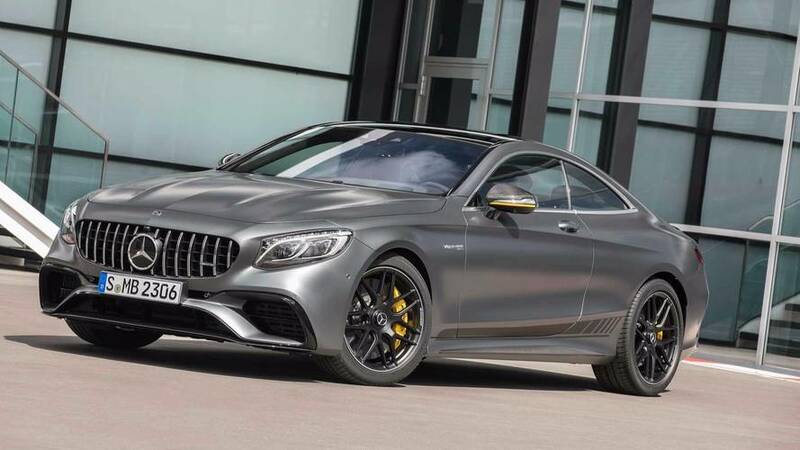 To fit the “night” portion of the edition's name, this version of the S63 Coupe comes in either a Selenite Grey Magno or Night Black Magno exterior. The “yellow” part of the moniker comes from the color of the trim on the mirror housings and brake calipers. The model rides on a set of black wheels with seven sets of double spokes. To dress up the styling, the Yellow Night Edition comes with the Aerodynamics Package that includes a larger front splitter and lip spoiler on the trunk. These parts generally come in high-gloss black, but Mercedes changes them to carbon fiber when buyers order the Carbon Fiber Package. A set of stripes run along the lower edges on each side of the coupe. Inside, Mercedes dresses this edition in yellow accents. These flourishes decorate sport seats, the top of the steering wheel, instrument panel, door panels, armrests, center console, and floor mats. A mix of matte-finished carbon fiber and black piano lacquer provide sporty mix of trim. Diamond-patterned nappa leather covers the cabin. 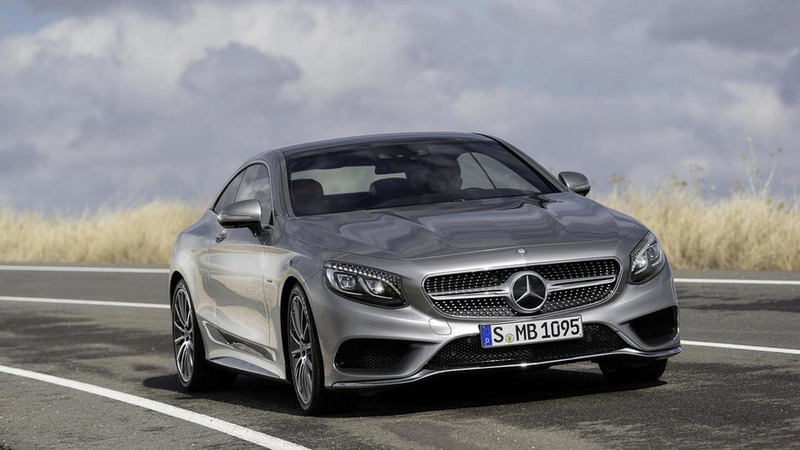 The refreshed S-Class Coupe and Cabriolet in AMG-trim now feature Mercedes-AMG's Panamericana grille and move to the company's 4.0-liter biturbo V8 with 604 horsepower (450 kilowatts) and 664 pound-feet (900 Newton-meters) of torque. The S65 continues to use a 6.0-liter biturbo V12 making 621 hp (463 kW) and 737 lb-ft (1,000 Nm). Stuttgart. With their unmistakable design and materials with superlative value appeal in the interior, the new S‑C lass Coupé and Cabriolet are the embodiment of contemporary luxury. The further-developed design exudes even greater sportiness while showcasing the technical expertise. Mercedes-AMG, too, has updated its S‑Class Coupés and Cabriolets with a host of technical and visual highlights. The S 63 4MATIC+ Coupé (combined fuel consumption: 9.3 l/100 km; combined CO2 emissions: 211 g/km) is additionally available at market launch in the form of an exclusive Yellow Night Edition. The first new S‑Class two-door models can now be ordered at prices starting from 101,655.75 euros and will be in European showrooms from the end of January 2018. As members of the large and successful S‑Class family, the Coupé and Cabriolet benefit from the same extensive innovations that were only recently introduced on the Saloon. These include new or functionally considerably extended driving assistance systems, the modern control and display concept with Widescreen Cockpit and the new generation of steering wheels, integrated ENERGIZING comfort control and the latest infotainment generation. In combination with the standard LED Intelligent Light System, unique headlamps with a total of 47 Swarovski crystals are available (3332 euros). 17 angular crystals form the flare-shaped daytime running lamps, while 30 round crystals make up the turn indicator lamps. Exclusive to both of the two-door models and part of thestandard equipment specification are OLED tail lamps ("organic light emitting diode"). With this technology, wafer-thin layers of organic materials are printed onto a glass plate and caused to illuminate. Locking and unlocking the vehicle is additionally emphasised by an animated dynamic light sequence with subsequent dimming-up of the tail lights. 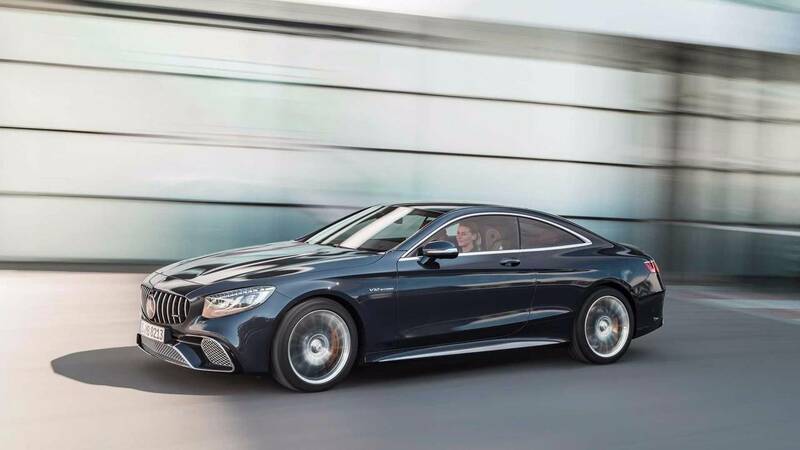 Numerous new or comprehensively revised assist systems are bundled together in the optional Driving Assistance package (2737 euros; standard on Mercedes-AMG S 65 Coupé and Cabriolet). Active Distance Control DISTRONIC and Active Steering Assist now provide even more comfortable support for the driver to keep a safe distance and steer. The speed is now adjusted automatically ahead of bends or junctions. This is complemented by Evasive Steering Assist, a considerably improved Active Lane Keeping Assist and also the additional functions of the Active Emergency Stop Assist. Also included in the Driving Assistance package is PRE‑SAFE® PLUS, which additionally takes into account dangerous situations caused by traffic following behind, such as a rear impact. The new S-Class Cabriolet is optionally available with the automatic AIRCAP draught shield system (1178.10 euros; standard on Mercedes-AMG S 65 Cabriolet). This can be extended at the touch of a button to reduce turbulence in the interior. AIRCAP consists of two components: a wind deflector with a grid in the windscreen frame that is extendible by seven centimetres and an extendible draught-stop behind the rear seats with convex contours and stainless steel trim elements. Also optionally available is a draught stop (773.50 euros). Another optionally available feature is AIRSCARF neck-level heating (773.50 euros). This extends the convertible season by enabling comfortable open-top driving even at low outside temperatures. With this patented neck-level heating system, warmed air circulates around the head and neck areas of the occupants from the head restraints. An innovation in terms of interior comfort and well-being is ENERGIZING comfort control with six programmes that combine different comfort functions into a harmonious package. This enhances physical comfort and performance while driving and during a break. ENERGIZING comfort control is available in combination with the AIR-BALANCE package (440.30 euros) and the new extended ambient lighting with 64 colours and 10 colour worlds (476 euros) and costs 238 euros. All S-Class Coupés and Cabriolets come as standard with the latest-generation COMAND Online infotainment system as well as the Smartphone Integration package. This allows the use of Apple's smartphone-based infotainment system CarPlay™ and Google's Android Auto. If a corresponding smartphone is connected by USB, the customer can, if desired, switch to the CarPlay™ or Android Auto interface. At market launch, the S 63 4MATIC+ Coupé will be available for six months in the form of an exclusive Yellow Night Edition starting at 202,121.50 euros. This special model painted in a choice of selenite grey magno or night black magno is discreetly distinguishable by a yellow trim strip on the exterior mirror housings. The exclusive impression is reinforced by 7-spoke light-alloy wheels in black with high-sheen rim flanges as well as the yellow-painted brake callipers of the AMG high-performance compound ceramic braking system, which is standard equipment on the Edition. The special character of the Yellow Night Edition is further underlined by the Aerodynamics package, with a larger front splitter in high-gloss black (in carbon fibre in the Carbon Fibre package) and a spoiler lip on the boot lid in high-gloss black (in carbon fibre in the Carbon Fibre package) as well as wrapped AMG racing stripes on the sides of the vehicle. The interior also features yellow accents. They decorate the AMG sports seats at the front and the rear seats, the AMG Performance steering wheel with 12 o'clock marking, the instrument panel, the beltlines, the door centre panels, the armrests, the central console at the front and rear and the floor mats. The Edition emblem in the steering wheel bezel draws attention to the special equipment. AMG matt carbon fibre/black piano lacquer trim parts round off the look. The Exclusive Package is fitted as standard on board. This includes upholstery in exclusive nappa leather with a layout in a typical AMG diamond pattern and perforated areas, the upper dashboard section, centre armrest, front and rear armrests and door centre panels in nappa leather with contrasting topstitching, AMG badges in the front and rear seat backrests, illuminated AMG entry sills and special AMG floor mats.